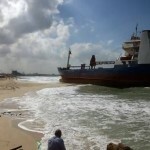 The 78 meter long, 3099 dwt freighter Sea Blue went aground off Sharjah, UAE. 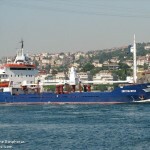 The Sea Blue had departed from Dubai in bad weather bound for several ports along the East Africa. The vessel only traveled a short distance when it had suffered engine failure. Pushed by wind and waves, the Sea Blue quickly went ashore. No reports of injuries to the 11 crew on board. Conflicting reports state the vessel may be dismantled on site or will be later refloated.